This sawmill was the second to be built on the same site. Constructed in 1879 by T.G. Askew, it was converted to steam power by Croft & Severne in 1883. The mural is based on a photograph in 1886. A mill operated continuously at this site for over 100 years before shutting down for a short period in 1983. 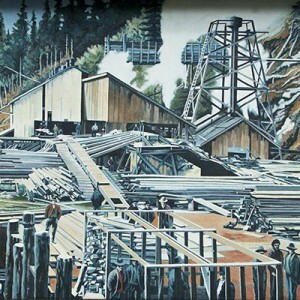 In 1985, MacMillan Bloedel opened a new modern mill, which marks the site of the longest continuous lumber production in BC.